At my house, it’s currently ice fishing season, which for me equals panfish cooking season. And as much as I love having locally, sustainably caught fish delivered fresh to my table, there are only so many ways to cook the bite-sized perch, blue gills and crappies. Yesterday with a free Sunday on my hands and nothing to do but watch the playoffs (Go Pack! 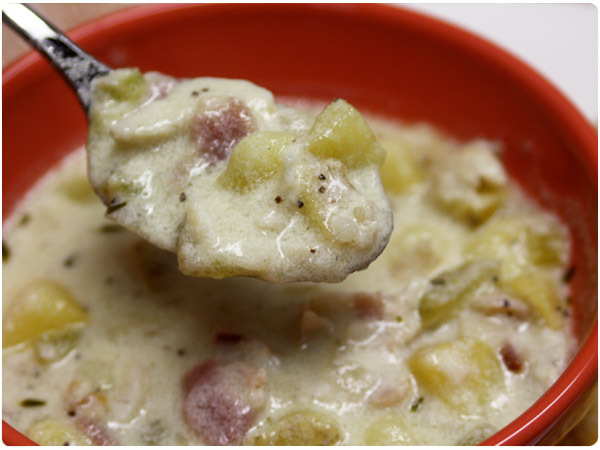 ), I detoured from our frequent fish fry and tested out a fish chowder. I based it on the tastes of a traditional New England Clam Chowder and was delighted with the results. If you don’t have a fishing obsessed person in your house, you can easily substitute a variety of other white fishes such as tilapia, walleye, pike or even cod. Try to use whatever is local to your area to get the freshest catch and best flavor. * Ideal substitutes would be other white lake fish, such as perch or walleye, but you could also use a mild white fish such as tilapia. Chop bacon into small pieces and place a large stockpot. Cook for 4-5 minutes, then add butter, onions and celery. Add bay leaves and season with thyme, salt and pepper. Cook until vegetables soften, about 5-7 minutes. Whisk in corn starch. Add clam juice, broth and potatoes and bring to a boil. Reduce heat and simmer for about 20 minutes until potatoes cook. Remove bay leaves. Add fish and half & half and cook for another 8-10 minutes. Season with additional salt and pepper as needed to bring out flavors. 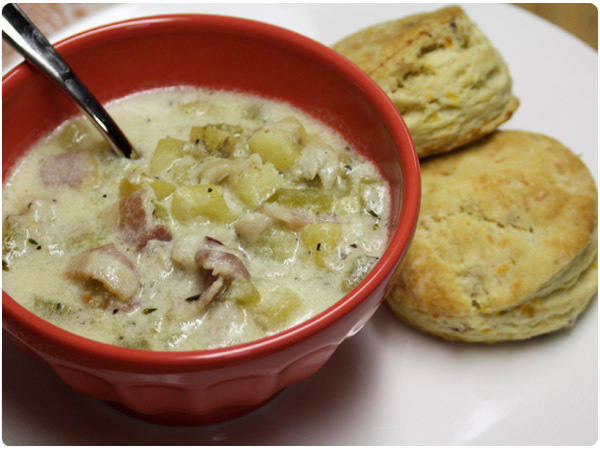 I served my chowder with some tasty homemade buttermilk biscuits that I gussied up with some bacon and cheddar because, well, who doesn’t love bacon and cheddar! In a food processor, combine flour, sugar, salt, soda and powder. Pulse 4-5 times to combine. Add shortening and butter chunks, distributing evenly over flour. Pulse 15 or so times until mixture is slightly crumbly. Add bacon and cheddar and pulse 3-4 times. Transfer to a large both and slowly add buttermilk, working mixture together with a spatula until dough is slightly sticky. Transfer to a clean, floured surface. Flour your hands and knead for 30-45 seconds so that dough becomes smooth. Reflour surface and roll dough into a large circle, about 1/2 inch thick. 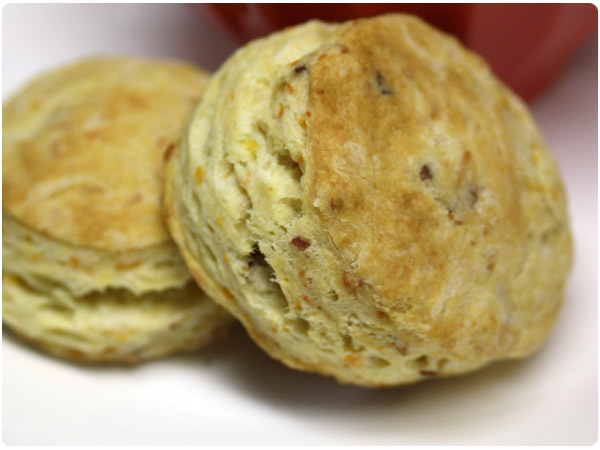 Use a 2 1/2″ round biscuit (cookie) cutter to cut each biscuit, taking care not to twist the cutter as you cut. This will prevent uneven biscuits. Place on a baking sheet. Bake at 400 for 15-18 minutes. Let sit for 5 minutes and serve warm. I wish I had the same problem as you. I LOVE fish. I’ve been toying with making a fish chowder and yours looks delish. BTW, do you have any recommendations for biscuit cutters? I have a these from Williams-Sonoma. Not knowing they were for biscuits, I got them with cookies and mini quiche crusts in mind. They come in very handy! Nothing better than soup or chowder on a cold winter evening. I’m going to have to try your recipe out this week. Great idea to pingback to Bill’s Poseidon blog! Oooh! I’m making my own bacon for the very first time and need a recipe to try the fresh bacon out on when it’s finiahed. This one is perfect! Thanks for sharing. whoa! I thought I was getting fancy making biscuits from scratch but THAT is impressive. We’d love to hear how it turns out! As the weather is turning colder, I thought this would be a great recipe to try out. Do you think I could put extra biscuit dough in the fridge for a few days and bake then? Wondering if they would still taste as good as they did tonight. Love all your recipes & the blog. @Andrea – You could certainly try it! I mean, store-bought biscuits keep in the fridge right? I would probably wrap them as tightly as you can and only store for a few days though just to maximize freshness. You’ll have to let me know how it works for you!